rogue one is basically the film that force awakens would've been if J.J. Abrams really didn't care about the characters. It's pro-war for both sides of the conflict (insurgent and empire), which I'd argue is bad. It borrows the imagery of both real wars and war films to tell a pro-war story. It's a "gritty" film where the main characters kill with impunity and where everyone dies in the end. It prioritizes the nostalgia of the audience to the point of self-parody, intentional (funny) and unintentional (bizarre and reptilian). To wit, there's a bit where Darth Vader shows up, force chokes someone, and makes a pun out of it ("don't choke on your ambitions"). Then he leaves. Seems like an paranoid attempt to maintain series continuity? Probably why she/they all die? The humanizing traits (humor) are relegated to the side characters, who are good but who get disposed of by the end (see above). I'd suggest that suicide missions are cruel and sad. Sort of like "The Thin Red Line" where the humanity of the soldiers is being destroyed by war, not validated. There's some brazenly stupid ship-crashing which I found enjoyable. I say this b/cause the entire squadron of characters is disposed in the end, indicating that humanity isn't important, Star Wars is. This doubly indicated by the final surviving character being a simulacrum of 1970's era Carrie Fisher. the whole film seems vampiric for this reason. Vampiric b.c it sees the force as a path to morbid greatness, but then has characters die for no reason other than franchise overpopulation. The diversity casting is pretty good. Vampiric b.c it suggests in the face of apocalypse we should welcome the dying of the light. these stakes more or less being the stakes you put into art. the things you say, the things you're willing to show. You put your face (an image) on your words. images-of-text have become an efficient way to share text. It's not that fair to call a meme poetry, though. If you put a poem on it, maybe, but how many "poem memes" do you see? Dan Hoy actually has a tendency to make short poems that could fit on a meme. These, he contains in short videos. I find the effect of these videos as dialogical, more than the usual entrancing effect of youtube. That is, they're still entrancing, but only for a brief period. So it's more of a verb or noun. One complete idea-- a meme. At the same time, they fail to, as memes, go viral. They're mostly used in Dan's essays as a kind of word. Poetry memes are supposed to self-sustain. This is a quote, possibly a part of a larger poem, self-attributed by the author. These fit pretty well into the tradition of, you know, short poems. Dan's kinda have more self-sufficiency for being self-consciously short and well-stated. You would say for Lukas W.'s poem above, that the impetus to be a quote has kinda overtaken the poem. Then again, there's no line breaks, it's just a quote. So a poem it will be, and a text/picture one too. it contains one significant, appealing idea. it's this kinda stuff I don't like. Because it's saccharine. Or it just brazenly puts forward this idea of poetry I don't like at all. 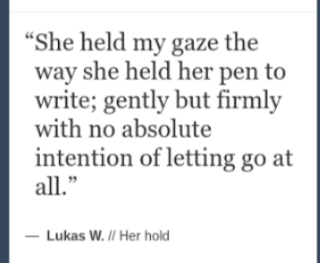 and thus eventually poems were written to be quotes. That's popular poetry, on tumblr. the standard kind of poetry you'd see in a book (which wouldn't be a quote). I'm more of a fan of blogs. I really love Dan's blog posts. on how to be a poet. An alternate world. With lofty goals. And the promise of fame. use poetry for something critical; criticism. 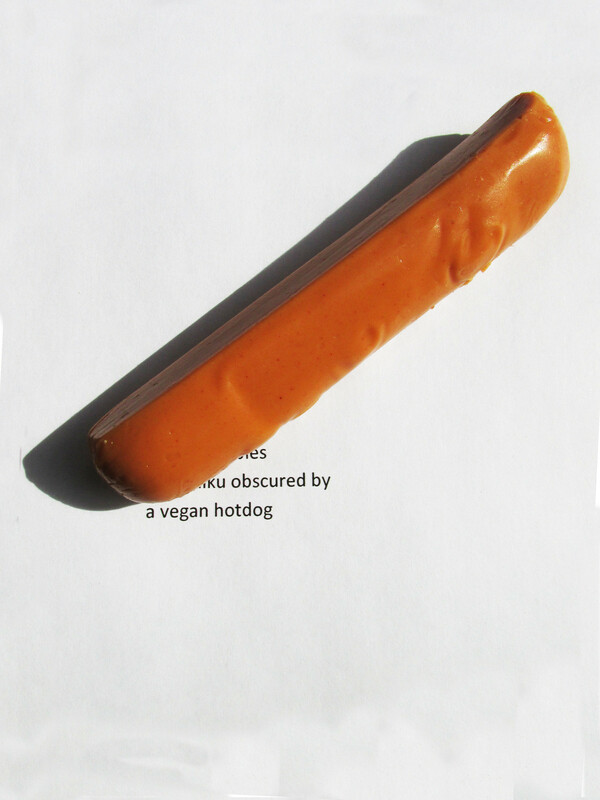 "seven syllables of a haiku obscured by a vegan hotdog"
and a poem, all in one. It went viral! It's on imgur. It got posted to my feed, multiple times. once I get the plan for it. I have a few collaborators. I've told a few in the city about it already. This is how I usually am. I was really struck by comparing these two images. The first one was on the front of nyt.com. The second one I found when I thought the first one kind of looked like Freddy Mercury. They're both holding the gun or microphone in sort of the same position. Their jackets are billowing up. Also they're kind of color inverses of each other, black suit/ white exterior, white clothes/ black exterior. The notable difference is the body and the paintings. Also, the expressions: obviously the as-yet-unnamed gunman in the first is facing his imminent death, making a political statement about Russia and Syria. It's an assassination, an act of terrorism. He's also doing this in front of a bunch of cameras; thus the high-quality photo, a photo shoot photo. The first image is striking and composed in a way that sends a direct message. Even without context it sends a narrative. I'm sure already there are /pol posts about this gunman. In the process of image making, some popular images gain life as reaction images, get text added to them, are used to express. 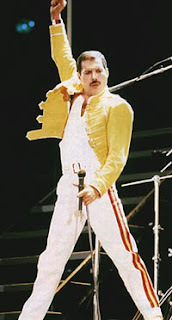 This image has the unmistakable verve that belongs to these category of images, such as the one of Freddy Mercury making the above pose, which has been redrawn and captioned on reddit and other places on the internet, to express victory. I think the first image as well is an expression of victory, a terrible one. 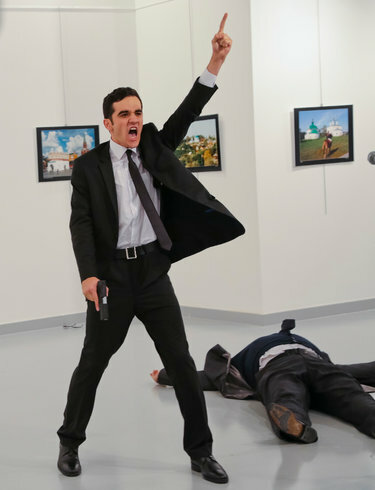 By the very clarity of the image, the composition of it, and the focus, the image represents the terrible victory of the gunman who sought to create an impression. Devotional violence; using violence as an image-making, impression-sharing tool, as a way for people or institutions to threaten. Dexter Filkins talks jokingly that terrorists get off on their devotional pre-suicide bombing images. Gandhi uses nonviolence and the British press to win independence form India; I think there's a lazenby quote about flipping the bugs on their backs or whatever. Lunch counter protests where black folks sit down at the counters and don't move and generate images of white people abusing them at the counters. The use of images, at least, to gain notoriety, and the subjects of the images themselves are affected. That Russian Ambassador is dead; the gunman is dead; people are traumatized. & this all in response to genocide. So you take the opportunity to have sympathy for one side or none or rightfully evince repulsion, but the strength of the image remains; that's what incredible about it, is that, abject as it is, it remains composed, it remains undeniably strong. This is my analysis of that image, it's powerful, this the collaboration between gunman and photographer. It feels like a pathway into fascism. Sure, the attraction of that power. The strong iconography, glorification of violence. Recognizability. I think we're able to compete on the same scale, generate our own images for anti-fa. Take out the central figure, take out the violence. Still make it essential. Sure, Freddy Mercury.